This page contains the archives (sorted by date) for the past Computer Society Chapter meetings and workshops. 23-Juy-2017 2017 Summer Potluck Picnic (Jointly hosted by Computer Society & WIE) Download the event PDF Flyer or the WEI event PDF Flyer. Innovative Approaches & Design Challenges for Big Data Architectures by Brian Finley, Lenovo . Download the meeting PDF Flyer. 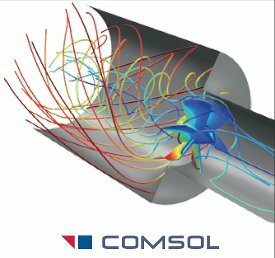 Automotive Functional Safety by Rami Debouk and Sharan Kalwani . Download the meeting PDF Flyer. GPUs from Gaming to Deep Learning & Cancer Research. Download the PDF flyer. The presentations will be available on the Embedded Systems Workshop 2016 page along with links to the sponsors. The presentations will be available on the Embedded Systems Workshop 2015 page along with links to the sponsors. The presentations are available on the Embedded Systems Workshop 2014 page along with links to the sponsors. The presentations are available on the Embedded Systems Workshop 2013 page along with links to the sponsors. Vision Guided Robotics (VGR) for Manufacturing Efficiencies Adil Shafi, President of Advenovation, Inc., speaker for the Computer Society Chapter at the Fall 2012 Section Conference. The presentations are available on the Embedded Systems Workshop 2012 page along with links to the sponsors. Advances in Vehicle networks, John McNelis, DG Technologies, Inc. 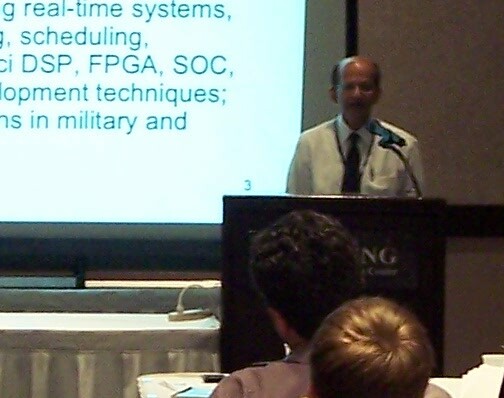 Mercurial Source Control Introduction, Mark Ciechanowski, P.E., DG Technologies, Inc.
IEEE Smart Tech Metro Area Workshop: Detroit. 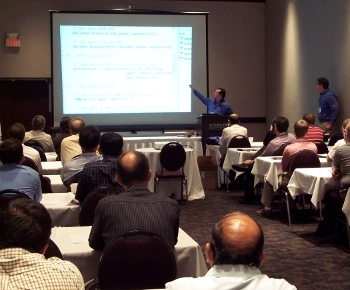 Smart Tech was a two-day workshop with parallel all-day multiple tracks. The Computer Society co-sponsored the event, and the Computer Society Chapter presented the first day on embedded systems. 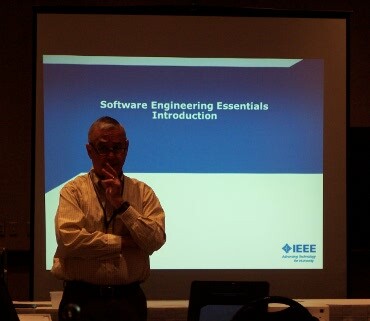 The second day was Software Engineering Essentials. Advances in Vehicle Networks and Diagnosis, S. Prasad, DG Technologies, Inc.
GPU Programming: Highly Parallel Computing for Embedded Applications, Jim Morgenstern, Image Mining, Inc.
Live demonstration of the COMSOL Multiphysics modeling environment and the unique opportunity to work with the tool in a hands-on computer session. Open source Development Tools Update, Mark Ciechanowski, P.E., DG Technologies, Inc. Vehicle Embedded Health Monitoring, Srinivasa Prasad, Vice President of Advanced Engineering, Dearborn Group, Inc.
Embedded Debugging and the Open Source Tool Chain, with Demonstration, Mark Ciechanowski, P.E., Senior Firmware Engineer Dearborn Group, Inc.
Type-2 Fuzzy Logic Controllers: Towards a New Approach for Handling Uncertainties in Real World Environments by Hani Hagras, sponsored by the IEEE Computational Intelligence Society. A Software Design Method for Embedded Systems Berndt, Don. by Don Berndt, sponsored by the IEEE Computer Society. Disclaimer: The views or opinions expressed by the speakers are solely their own and do not necessary represent the views or opinions of the Southeastern Michigan Computer Society or the IEEE.